Dynabrade 69040 6" (152 mm) Dia. Non-Vacuum Dynorbital® Silver Supreme Random Orbital Sander .26 hp, 12,000 RPM, 3/32" (2.4 mm) Dia. Orbit, Rear Exhaust available from BND Abrasives Ltd! Please call for special prices and availability. Discount available for distributor / resellers! Call 01264354133. 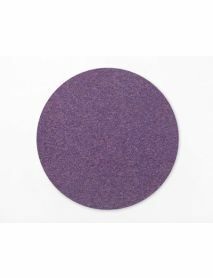 Includes low profile, premium urethane weight-mated sanding pad. 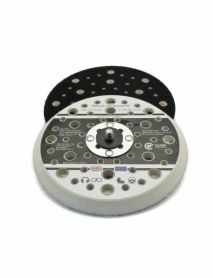 Optional vacuum conversion kits are available to easily convert non-vacuum tool to self-generated vacuum tool or central vacuum tool. Black lever identifies 3/32" (2 mm) dia. 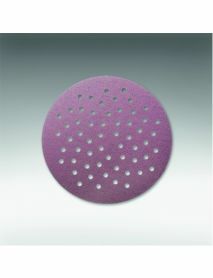 orbit, used for general sanding. True 12,000 RPM air motor. Floating rotor utilizes five blades, producing more usable power (.26 hp/194 W). High-strength, composite rotor has better lubricating qualities, allowing blades to last longer. Less air (16 SCFM/450 LPM) is used more efficiently to maintain maximum power. Comfort Platform provides additional hand and wrist support, further enhancing operator comfort. Also offers increased protection against cold air exhaust. (NOTE: Comfort Platform is removable.) Throttle lever recesses into housing grip when depressed, eliminating pressure-point on operator's palm. Lever is made from composite material to insulate against cold air. Lever is color-coded to designate tool orbit. Drop-in motors available for quick and easy maintenance; minimizes downtime. Muffler elements are easily changed for convenient maintenance. Low Sound Levels. Muffling system reduces exhaust sound levels. For high production usage. Enhanced ergonomic features. Steel cylinder and end plates increase motor efficiency. Efficient vacuum capabilities. Stay-tight threaded muffler. Single-piece lock ring.Patented bearing protection. Easy-to-read laser markings.